Seeing a "Showman' Guide" to this film has inspired me to produce a special feature for it. 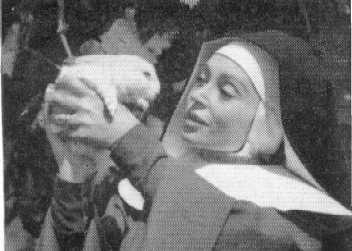 It was about a convent of nuns in Italy during WWII who rescued Jewish children from a local concentration camp. When the Germans found out about their activities they reacted in a predictably brutal way. 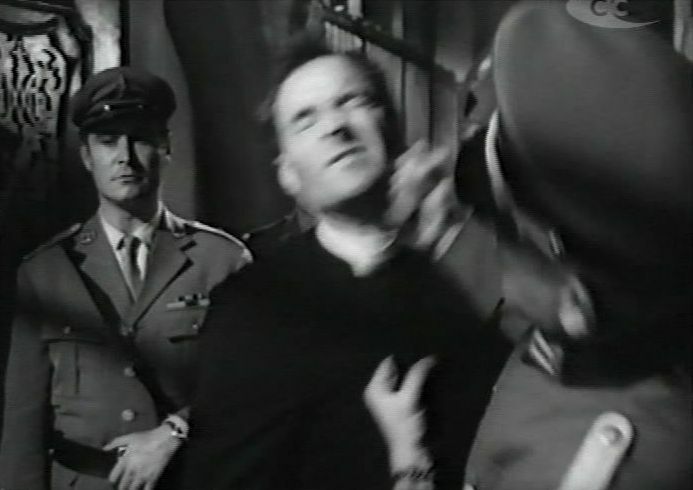 Goodliffe played a priest who was slapped by a German officer and "turned the other cheek". 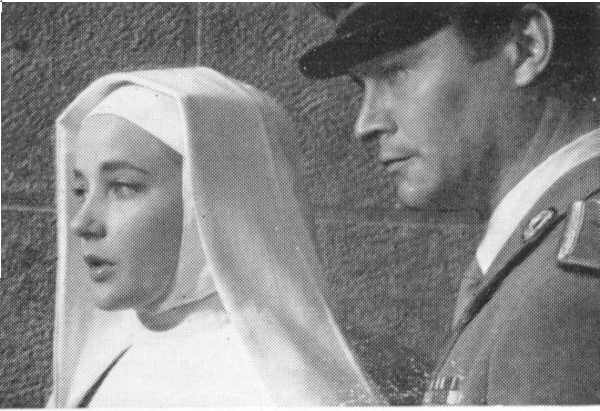 Sylvia Syms played a novice nun. 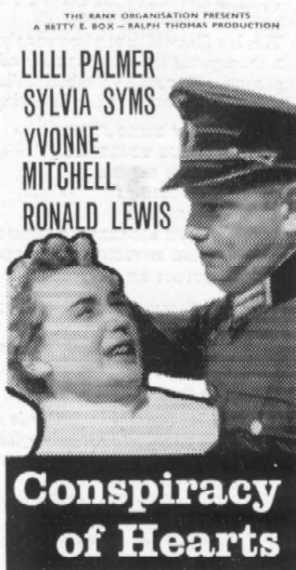 Ronald Lewis played an Italian officer with a conscience who turned a blind eye to the nuns' activities, until the arrival of the Germans. 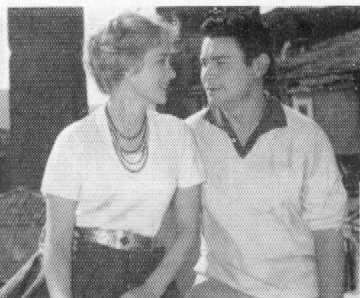 Sylvia Syms sang an "Angel Lullaby". The song was released as a single. Its ranking in the hit parade is not known. The firing squad, however, was composed of Italian soldiers who nobly fired into the air rather than at the nuns. 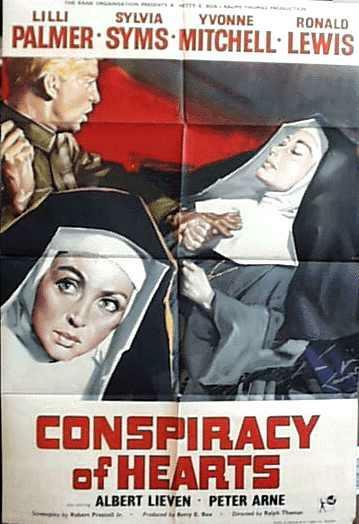 Here they are on a poster showing their horror at what the dastardly Germans had done to the nuns. The image of Lilli Palmer in front of the German with the gun seems oddly suggestive. 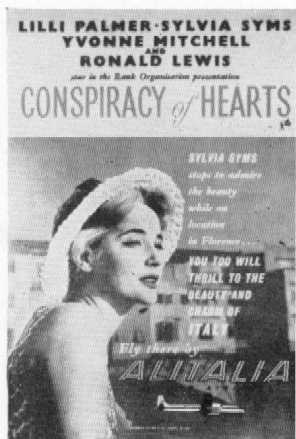 There is a poster jointly advertising the film with Alitalia and featuring Sylvia Syms in a tourist outfit: "Sylvia Syms stops to admire the beauty while on location in Florence. You too will thrill to the beauty and charm of Italy." "Opening night arrangements: Extend invitations for Church leaders of all denominations, and, if possible, nuns from all orders permitted to attend film performances, leading representatives of all women's voluntary services, including the Red Cross. Reach out to your Catholic and Jewish Communities... find any local personalities through your town who have made headlines by their acts of charity (for example adopting children). These too should prove newsworthy first time guests." "Remember the women. Big business is to be had from such sources and part of your campaign at least should be directed exclusively at women, for whom this film will hold a particular appeal. Personal letters to prominent local women, or leaflets delivered with copies of all but the cheapest women's magazines, are just a few of the "feminine" approaches worth following." "Letters of Recommendation: A managerial letter, personally addressed to selected groups, will prove a valuable publicity aid. Approaches should be directed at the following groups: factory executives, religious societies, women's guilds, soroptomists, large stores, women's ex-service associations, welfare officials and social secretaries, adoption societies." "Poster design contest: Sell the natural drama of this film by introducing a poster design contest... With the integral theme of love and humanity prevalent throughout the film there is limitless scope for entrants to demonstrate their ability and imagination." "Readers' letter contest: ... a film so stirring that it cannot fail to impress even the most fastidious of your patrons. The picture runs the gamut of love, devotion and sincerity throughout... Suggest to your local editor that he runs a contest in which readers would be asked to submit their personal story of love, devotion, humanity and sincerity." A film for opinion cards: You will best ensure adequate editorial coverage by inviting the editor and senior staff from local newspapers - with their wives." Tie up angle: Every shop lays claim to offering four star service, and on this basis a phrase along these lines can be used: "If you want four star quality use Smith's Dry Cleaning Service - and if it's four star entertainment you like don't miss Lilli Palmer ... in "Conspiracy of Hearts" at the Rex next week."" "Flowers are a universal delight and create an atmosphere of luxury, beauty and glamour. 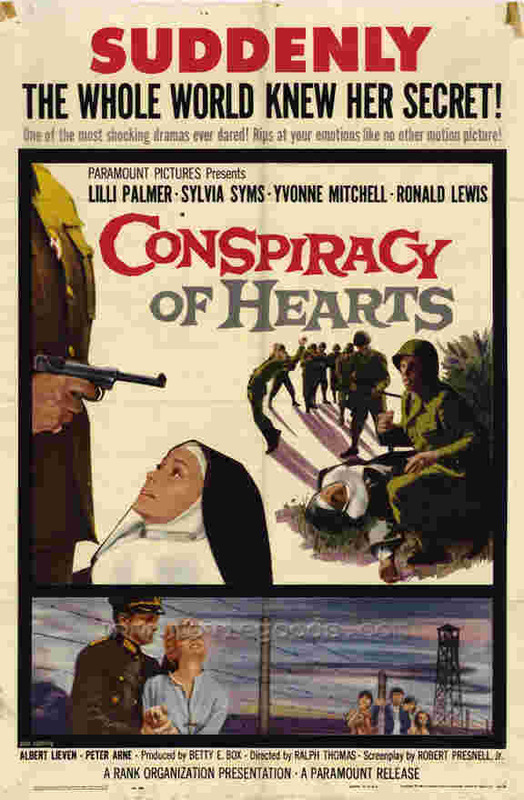 They should prove particularly appropriate in relation to "Conspiracy of Hearts". Arrange a tie up with your local florist for the title of the film to be spelt out in attractive seasonal flowers in your foyer - the border of which should be a giant heart." "Approach stores, such as haridressers, exclusive gown stockists and large fashion stores. In fact, any place liable to be frequented by a large contingent of women. Then suggest they have a special window display showing goods or designs that could be labelled "Exclusive" or worthy of a "Seal of Merit". These could be augmented with scene stills from "Conspiracy of Hearts", with accompanying copy reading: "These are just some of our "Seal of Merit" designs - visit our showrooms and see our extensive range. 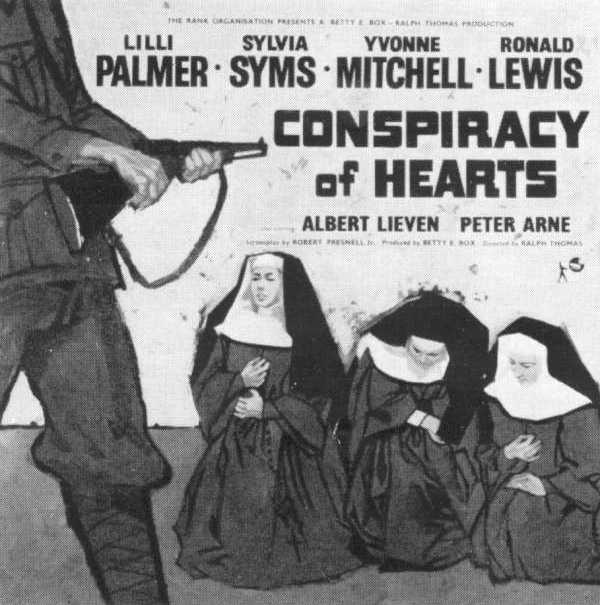 "Conspiracy of Hearts" - the "Seal of Merit" film - is showing at the Rex next week. Don't miss it!" Share every dangerous second of the war's most amazing mission of mercy! Angels of mercy in defiant action ... in a world where all hell was let loose. The silent army that saved a nation's tomorrow. A story that will tear at your heart in its dramatic realism! The nerve tingling story of a handful of women pitted against the Gestapo. One of the most shocking dramas ever dared. Rips at your emotions like no other motion picture!